General Vides Casanova. Photo Credit: Latin America News Dispatch. Thursday, April 9, 2015—Gen. Carlos Eugenio Vides Casanova, former chief of El Salvador’s National Guard and then Minister of Defense from 1979-89, was deported from Florida yesterday as a result of a precedent-setting decision by the Justice Department’s Board of Immigration Appeals, following 16 years of legal efforts by human rights groups against him. In 1999, The Center for Justice and Accountability filed a case against Vides Casanova and another former defense minister, Gen. José Guillermo García, charging them with liability for the torture of three Salvadoran civilians under the “command responsibility” doctrine illustrating intellectual authorship. The case, Romagoza et al. v. Generals Garcia and Vides Casanova, cemented the legal authority of the command responsibility doctrine with a verdict demanding 54.6 million dollars in reparations from the two defendants. [H]e participated in the acts of torture and extrajudicial killing of civilians in El Salvador, in that they took place while he was in command, he was aware of these abuses during or after the fact, and through both his personal interference with investigations and his inaction, he did not hold the perpetrators accountable. Among the cases cited by the Board were the killing of four American churchwomen in 1980, and the 1981 “Sheraton Hotel” murders targeting a Salvadoran labor leader and two U.S. advisors to an American labor association. Both crimes were carried out by members of the National Guard. 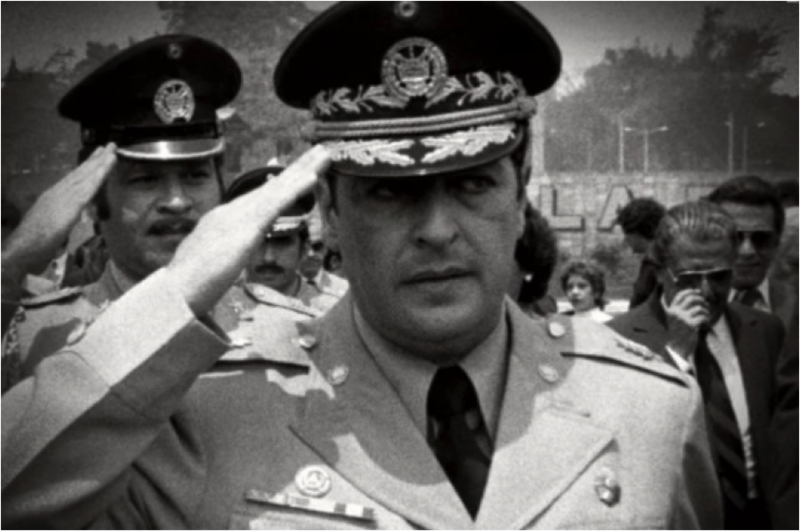 Over the years, the National Security Archive has contributed hundreds of declassified U.S. documents to the investigations against Vides Casanova, illustrating the general’s role in human rights violations throughout his tenure as a commander in the Salvadoran military and guard. Among the documents are United States Department of State cables and memoranda concerning the 1980 abduction and murder of the four churchwomen that reveal Vides Casanova’s attempts to cover up the crime. In his dispatches to Washington, Ambassador Robert E. White strongly condemned Vides and other elements within the security forces for their lack of cooperation in the murder investigation. As a result of the Center for Justice and Accountability’s continuing advocacy, the former general was indicted on two counts of immigration fraud in 2009. Trial hearings included testimony by three U.S. ambassadors, torture victims Pedro Daniel Alvarado and Juan Romagoza Arce, and expert witness Terry Karl, professor of political science at Stanford University, who used National Security Archive documents in her analysis. The presiding immigration judge found General Vides Casanova to have “assisted or otherwise participated in” human rights crimes including the torture of Daniel Alvarado and Romagoza Arce, the killings of the head of the Salvadoran agrarian reform institute and two American labor advisors, and the killings of the four American churchwomen discussed above. On March 11, the Board of Immigration Appeals decided to uphold the immigration judge’s decision under the Immigration and Nationality Act. Rather than affirming the defense argument that Vides Casanova could be deported only if determined to have taken “personal action” in facilitating the torture and killing described above, the Board of Immigration Appeals found the defendant guilty, according to Terry Karl, because Vides Casanova “1) had command over his troops, 2) knew or should have known what his subordinates were doing, and 3) failed to prevent egregious acts or punish his subordinates who committed such acts.” Although the defense appealed the Board’s decision, that appeal was denied. Patty Blum of the Center for Justice and Accountability calls the ruling “very significant” because it marks the first time that the Board of Immigration Appeals has connected the intellectual authorship of human rights crimes with requisite deportation. The precedent-setting ruling will act as a benchmark for future cases, ensuring that those in command during a regime of human rights abuse are themselves seen to have participated in that abuse, and will not find a safe haven in the United States. 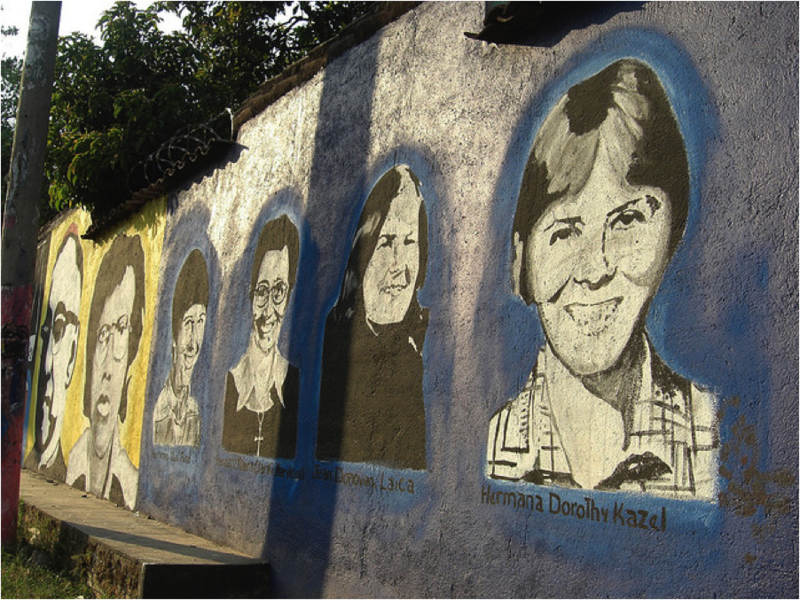 A mural depicting the four American churchwomen killed at the command of General Carlos Eugenio Vides Casanova in 1980.